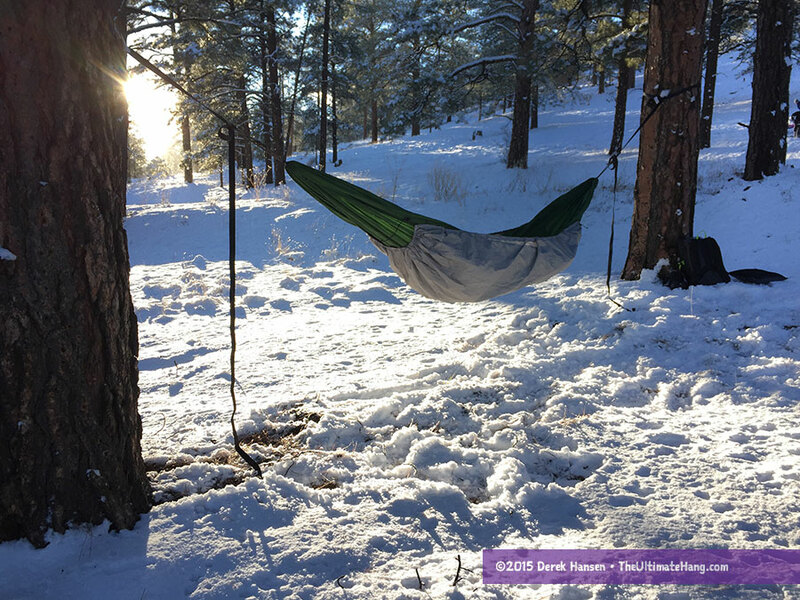 The Therm-a-Rest Slacker Hammock Warmer is best described as a technical weather shield that provides and effective cover to block wind, shed precipitation, and reflect radiant heat, thanks to the permeable aluminized inner liner and a water-repellent shell. The Therm-a-Rest Slacker Hammock Warmer starts off as a rectangular sheet of fabric that has been gathered at the short ends with some non-adjustable elastic. Running down the long ends are channels that carry a loop of 2mm line. The line has small cord locks on each end that can be used to a adjust the tension on the fabric. On the inner side of the fabric is an aluminized surface, designed to reflect radiated heat. The aluminized surface is designed to face the hammock and the occupant. The outer side of the fabric is coated and is hydrostatic, providing both wind and precipitation protection. 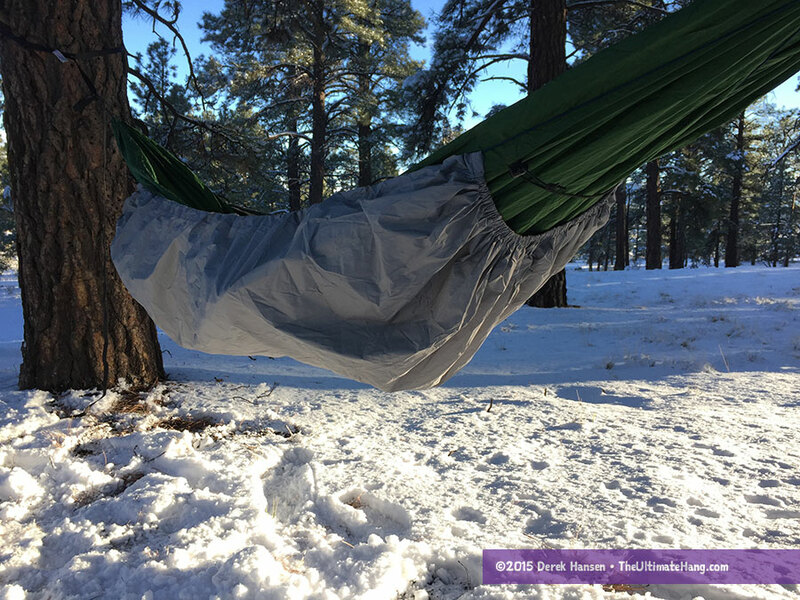 In a nutshell, the Warmer is a high-tech weather cover, designed to protect the underside of a hammock (like an underquilt) to keep the occupant warm. Years ago, I tried using different styles of mylar “space” blankets (a.k.a emergency blankets) to boost my hammock insulation systems. One of the downsides to these aluminized sheets is that they are often non-permeable—they don’t breathe. This often results in condensation, which can be mildly annoying in some cases, and chilling and potentially dangerous in cold situations. I expected to see some condensation when I tested the Warmer, but night after night I couldn’t feel any moisture build up. I tried testing indoors and outdoors in temperatures down to 25°F (-4°C) without any condensation. When I wrote to Therm-a-Rest they confirmed that the material is actually a proprietary, permeable fabric that they use with their sleeping bags—ThermaCapture™. The fabric was designed to wick away moisture and has a CFM rating of just over 1.0. I had to do a little research to understand “CFM.” Manufacturers generally measure wind resistance by cubic feet per minute (CFM) to see how much air will pass through the fabric over a certain amount of time. A 0 CFM rating means it is totally windproof, like plastic. Soft-shell fabrics usually have a 1–5 CFM rating, which means they are functionally windproof but have excellent breathability and wicking, allowing insensible moisture to pass through the fabric. Other fabrics, like some fleeces, have higher CFM ratings, which lowers the wind resistance but increases the breathability. The Warmer’s 1.0+ CFM rating is actually pretty good for a coated fabric that is designed to shed precipitation, block wind, and resist condensation. In my own testing, I never saw any condensation. This is actually a very surprising and exciting fabric. I keep thinking of adding some insulation and an outer shell to the Warmer to create a higher-functioning underquilt. The possibilities are exciting (hint: Therm-a-Rest, will, or are you planning to make a ThermaCapture™ underquilt in the future?). When I tested the Warmer indoors, I was able to use it by itself, but just slightly. Our thermostat hovers around 68°F (20°C) in the winter, slightly cooler in some rooms. I’d guess I got down to around 65°F (18°C) with the Warmer alone and felt comfortable, but any colder and I would need something extra. Warm sleepers may be able to use the Warmer alone a few degrees lower. The Warmer is long enough to cover a full-length under quilt and the elastic gathered ends seal up well without any extra adjustments. I didn’t experience any negative leaking or sealing issues in my testing. Pairing the Warmer with an underquilt, especially when used as a weather cover to shed sideways precipitation and wind, is fantastic. I often use a weather shield, but having one that is breathable is a really, really good idea. The last thing you would want to do is wet out your insulation. The one downside to the Warmer was the use of non-elastic line to hold it close to the hammock. you can slide the cord locks to be closer to the end of the Warmer to re-adjust when you get in the hammock, but it isn’t very convenient. I would prefer to have shock cord instead so that I can tension and set the Warmer and have it stay in place without any fiddling. Like everything I’ve seen from Therm-a-Rest, the build quality and craftsmanship are tops. The stitching and seams are excellent, as are all the component pieces. I highly-recommend using an under cover or weather shield, like the Warmer, when paired with an asymmetric or short-sided rain fly to provide the added protection from the elements. Good under covers are multi-use items, like the Warmer, that can provide wind protection and even trap some dead air space to increase warmth. The Warmer can also be used a top cover like a bivvy cover. Is it possible to swap out the lines for elastic ones? What’s the stuffed package size? I use a hammock for motorcycle camping and space is at a premium. I’ve been using space blankets with a high degree of success, but like you point out, they don’t pass moisture well. Two decks of playing cards. If the cordage is removed, as in no “bunching”, what are the measurements of this sheet of thermacapture? Hemmings and such? Does it cover the same space as a grabber space blanket? I won’t hold you to an answer, BUT, with an underquilt, how much more effective do you believe it to be? I would look at it this way: an under quilt provides the warmth and insulation while the weather cover provides wind and moisture protection for the under quilt. A cover like this will add a few degrees of warmth to a quilt by blocking connective heat loss and trapping more dead air space. I think a good hybrid design would be to merge this weather cover with an under quilt instead of having them separate. This looks I deal to increase the warm on those windy nights. I hang is a Warbonnet Blackbird XLC and with 2/3 underquilt. Do you think the fit would work with this set-up? Yes. It easily fits over other under quilts and hammocks. Thanks for reviewing this. I’m looking for a low-priced UQ to use in Arizona and can’t decide between this and a SnugPak Under Blanket. Have you tried the SnugPak? If so, I’d be interested to hear your opinion. Thanks again. Mmm Arizona. My hometown 🙂 a synthetic quilt from arrowhead equipment is reasonably priced. I haven’t tested SnugPak, but it looks similar to the DD Hammock quilts. Good prices. Summer rating for warmth. 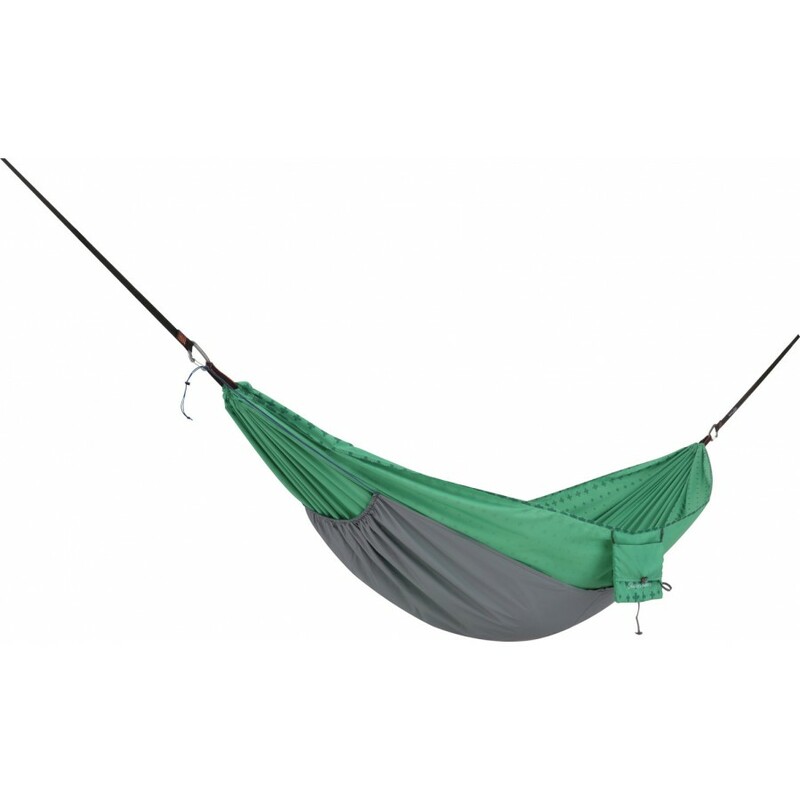 1) Is the shape of this hammock “warmer” compatible with a Warbonnet Ridgerunner? 2) Would it be possible to put a blanket between this and the hammock, and make it appropriately snug by adjusting the warmer’s tension? That is, could you put a “quilt” there without having shock cords and whatnot attached to the quilt? It can fit a ridge runner if you remove the elastic that gathers up the ends. It may work as is but you’ll have to hold it out and in place. To put a layer between you’ll need to ensure the suspension on the warmer is tight.